Is this vehicle safe to buy? You ask questions, our job is to answer them. Where can i find my car's VIN information? A VIN number records can be found on: The driver's side door, a sticker or a metal plate. The lower corner of the windshield, on the driver's side of the vehicle. Your vehicle title and registration. Your insurance card. How do i get a vehicle history record? You can download the most up-to-date vehicle records with DMV.com, or visit your local DMV. A comprehensive VIN history report will protect you from any foul play from a seller, such as: reversing the odometer, not disclosing previous repairs, or hiding accidents that may have damaged the frame or the vehicle. How to sell your car with a VIN number check? Preparing to sell your vehicle requires providing car info by VIN to potential buyers. 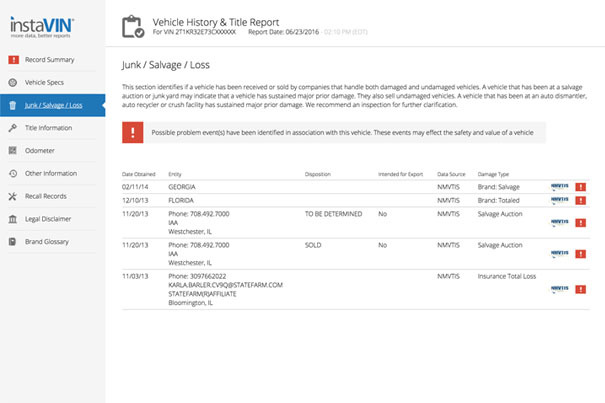 Prospective buyers who obtain a VIN number report will get through information about the vehicle and it's condition. As a seller, you can then effectively address any question or concerns regarding the sale, and also get closer to your asking price. DMV.com stands behind the data provided & we provide refunds in the case of any error in title data is not correct as evidenced by a copy or proof of such data error from a state title document. Why is my credit card showing a charge for a report that I did not receive? If you ordered a report for a VIN for which no data was available you may see an authorization on your credit card for the amount of the report you requested. This is an authorization only & will be released by DMV.com within 24 hours. Hold times may vary by individual banks. Is this a one-time charge? Please be assured that the charges for a single or multiple Vehicle History & Title Reports are one-time charges. There are no monthly automatic charges or fees. You are only charged for the reports you specifically purchase. Where does your vehicle data come from? 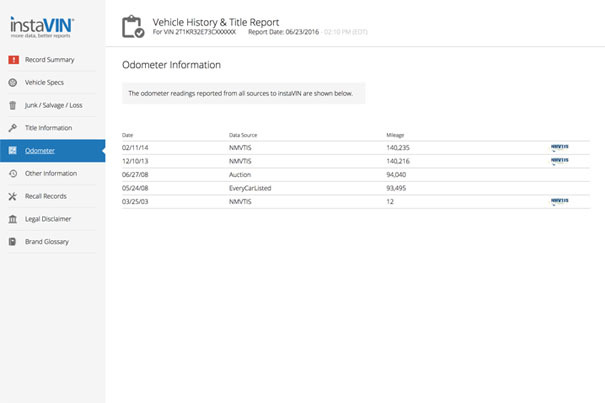 Vehicle history information comes from many sources including records on file from NMVTIS, state DMV, police records, fire & insurance records, data aggregators as well as many other proprietary sources. The National Motor Vehicle Title Information System (NMVTIS) was created through the Federal Anti-Car Theft Act of 1992, to help protect consumers from fraud & unsafe vehicles & to keep stolen vehicles from being resold. Why did I receive the message 'No Data Available'? You did not receive a report, & will not be charged, because DMV.com does not have enough information for the VIN you requested. You may see an authorization on your credit card for the amount of the report. This is an authorization only & will be released by DMV.com within 24 hours. Hold times may vary by individual banks. To learn more about The National Motor Vehicle Title Information System (NMVTIS), visit the NMVTIS vehiclehistory.gov website. Who operates & manages NMVTIS? The U.S. Department of Justice is responsible for oversight of the implementation & operation of NMVTIS, & works in partnership with the American Association of Motor Vehicle Administrators (AAMVA). AAMVA has been the operator since 1992. To learn more about NMVTIS visit the vehiclehistory.gov website. Cost for NVMTIS vehicle history reports vary & are determined by individual service providers. The Anti-Car Theft Act requires that the system be funded through user fees & not dependent on federal funds. For this reason, NMVTIS has been designed as a fee-for-service system. What's included in my VIN report? General Information, such as the Summary, Vehicle Specs, Title Information and more! Order a VIN check now to access your vehicle’s complete history. Whether you are buying a car, selling one or simply interested in learning more about your current vehicle, a VIN check can help. Vehicle identification numbers help record important information about a car, including title history, odometer readings, previous owners and much more. A VIN check puts these important details at your fingertips, helping you make informed decisions. Get yours now to access your vehicle’s record online. Some people prefer to complete their car-related transactions by mail. However, in the case of a VIN check, there is little reason to use conventional mail to run a car background check. Still, if you have access to a by-mail VIN check service and would like to use it to get information about a vehicle, there are a few factors to take into account. First, make sure you are not on a tight deadline if you are completing a task by mail, since this method usually takes longer than completing a task online. Second, be sure the payment method and information you provide are accurate, as any errors will cause delays. Depending on your state, you may be able to request a VIN check in person at the DMV. However, there are a few drawbacks to using this method. The primary one is that DMV lines are usually long and slow, so visiting a DMV location to perform a task you can simply do online will require more time and energy. Additionally, the VIN checks available through the DMV are often not as thorough as the ones available online. Many DMVs provide basic information about a car on their VIN checks, while online services pull together information from various sources, including the federal government and private companies. A VIN lookup is one of the most important things you can do before purchasing a used car in Arizona. The VIN number lookup will provide you with information including accident history, vehicle specifications, a safety report and even car title information. A vehicle history report is important for both buyers and sellers of vehicles, so continue reading the sections below to learn how to obtain this important document. The easiest method for a VIN code lookup is through a trusted online platform. You will simply enter the VIN number of the vehicle in question, and provide a little more information before being granted with a plethora of important details about the vehicle. Whether you are interested to look up VIN information for a car, a boat or another vehicle with a vehicle ID number, you can easily access the information you need to properly purchase or sell the vehicle. This online option is ideal if you need the information quickly, and want the simplest and most effective delivery possible. Checking VIN numbers in Arizona may also be done through the mail. For this method, you must complete the Motor Vehicle Record Request form provided by the Arizona Department of Transportation (ADOT), and mail it into the Motor Vehicle Division office. To complete the VIN history report request, you must provide your personal information, along with information about the owner of the vehicle – if that is not you. To have a VIN number check done, you will also need to pay a fee when you mail in the form. Plus, you must have the request form officially notarized. The entire process to obtain a VIN report through the mail can be lengthy, especially since a notary signature is required. Since the process is completed through the U.S. Postal Service, you will also have to wait before receiving the VIN number report in the mail. 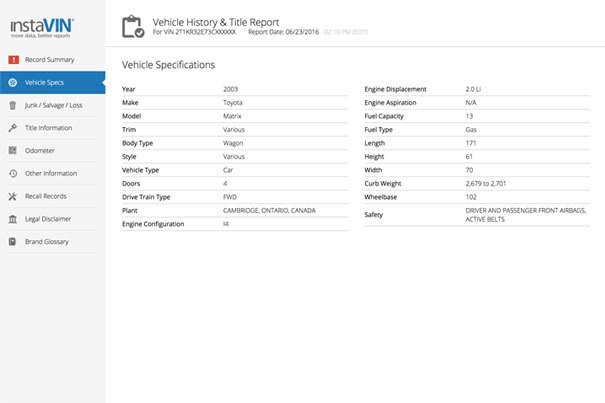 If you are in a rush to receive the vehicle history report, click here to access an instant online VIN history. What info is in an Arizona VIN history report? Why would I need to perform a VIN check in Arizona? Anyone purchasing or selling a vehicle should order a VIN check report in Arizona immediately, because it will ensure that the vehicle is safe and reliable – or prove that it is not. A VIN lookup is necessary, whether you are interested in buying a car, and want to know if the vehicle has been in any major accidents and if it is considered safe, or if you are selling a car and want to reassure potential buyers that it is reliable. Before you purchase a car, you should make sure that an Arizona VIN check is done so that you do not suffer from any unexpected financial surprises from the vehicle in the future. A VIN code check can help provide you with peace of mind when obtaining a vehicle by ensuring that you are completely aware of the history of the car. If you are unable to perform a VIN history check on a vehicle in which you are interested in purchasing, consider a different vehicle, instead, as this is a red flag. 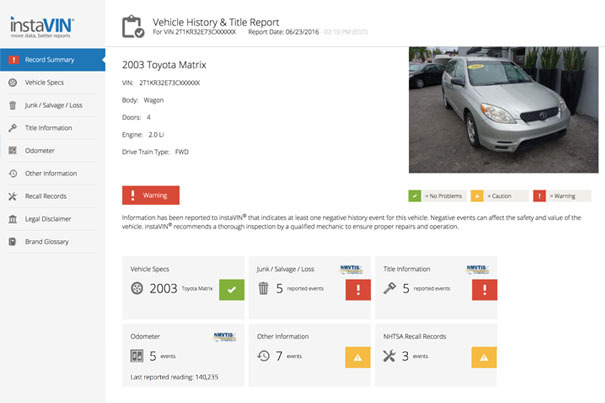 Providing a VIN history report to any interested buyers if you are selling a vehicle can make a huge difference in how quickly the vehicle sells, and how much money you can make on the sale. Being completely upfront and showing buyers the complete report will provide them with confidence regarding the purchase, and can help you to negotiate in your favor. How do I locate my vehicle’s VIN number? Finding the VIN number located on the car is the first step in requesting a VIN report. This unique, 17-digit ID number may be on the driver’s side windshield, in the lower right-hand corner – if you are outside the car, facing the front. It is generally above where the windshield wipers lay, and usually in the tinted part of the glass. If you do not see the VIN on the windshield, it is likely on the inside of the driver’s side door, near where the door latches to the body of the car. You may also find the VIN located on the car registration documents or on any auto insurance cards or paperwork. A vehicle history report in Arizona costs $3.